The Scorpio Full Moon – the opposition of the Sun and the Moon in Taurus-Scorpio – aligned with Sedna in Taurus. Sedna, named in honor of the Inuit goddess of the sea, is one of the most peculiar minor planets in our solar system. The Moon in Scorpio is passionate. The Venus-Uranus conjunction in Aries is reckless and fearless. The transformative Pluto in Capricorn is squaring the conjunction. Note, that Venus and Pluto are the rulers of Taurus and Scorpio, the signs currently occupied by the luminaries. As my friend, astrologer Len Wallick, reminded me today, this Full Moon in Scorpio combines with the Water trine formed by Huya, Salacia and Varuna, which was exact earlier this year. The January Full Moon was conjunct Varuna in Cancer, and yesterday the Moon fell in another water sign, Scorpio, conjunct Huya. All three are minor planets named after water deities from mythologies from different parts of the world. The excessive amount of water means copious feelings. Sedna’s orbit around the Sun is exceptionally long and elongated, and the orbital period is approximately 11,400 years. In an astrological chart Sedna works almost like a fixed star. Sedna is nearing its perihelion, the point where it is nearest to the Sun, in 2076. The last time it was this close to the Sun, Earth was just coming out of the last ice age. The story of Sedna is loaded with deep feelings, including disappointment and anger. It is also full of promise and hope. Sedna was a beautiful young Inuit girl who had many suitors. She and her family were starving. One day a hunter came and said that if he could have Sedna, he would give her father fish in return. Sedna’s father agreed. The hunter was really a birdman who took Sedna to a big nest on a cliff where she had nothing else but rotten fish to eat. Sedna cried for her father to take her back, so he came to rescue her, but the birdman caused a terrible storm which nearly sunk their kayak. In desperation, Sedna’s father threw her into the cold raging sea. Sedna tried to hold on to the boat, but he chopped off her fingers, which became seals, whales and other marine animals. Sedna descended into the depths of the Arctic Ocean and became the mighty queen of the underworld. Sedna must be treated with respect, otherwise she sends storms and starvation to the humans. Then a shaman must overcome his fear and visit Sedna in the deep waters, comb her tangled hair and calm her down again. When Sedna is happy, she releases her mammals and allows the starving humans to eat from the bounty of the sea. 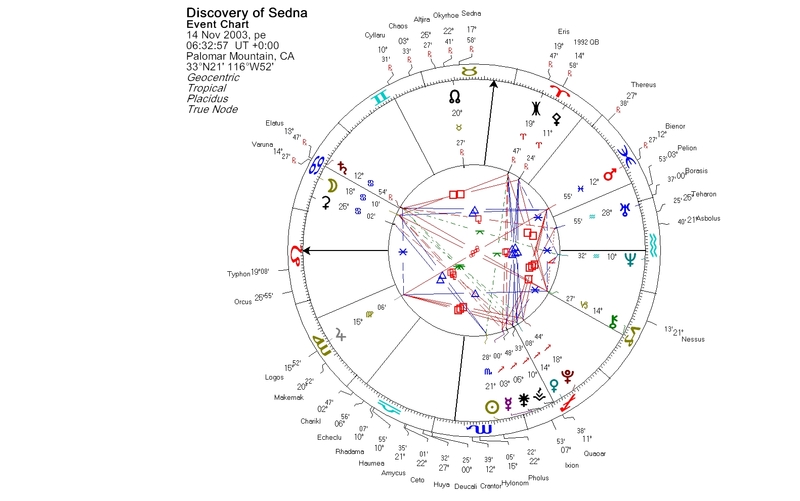 Some similarities can be noted between the discovery chart of Sedna and the Scorpio Full Moon chart of yesterday. Sedna was discovered on Nov. 14, 2003. The Sun was in Scorpio, opposite Sedna, whereas now it is in Taurus conjunct Sedna. We have just recently been witnessing the Grand cross pattern formed by Mars, Jupiter, Uranus and Pluto. In yesterday’s chart Venus was tightly squaring Pluto. At the time Sedna was discovered, Mars, Jupiter and Venus were forming a t-square, and Venus was in conjunction with Pluto. So we can expect to encounter some similar energies or phenomena in our lives as when Sedna was found. I was welcoming this watery, passionate Scorpio Full Moon spending hours at the water’s edge, watching boats, windmills and the sea. A sailing boat was launched, and a ship was coming in. A new journey is about to begin. 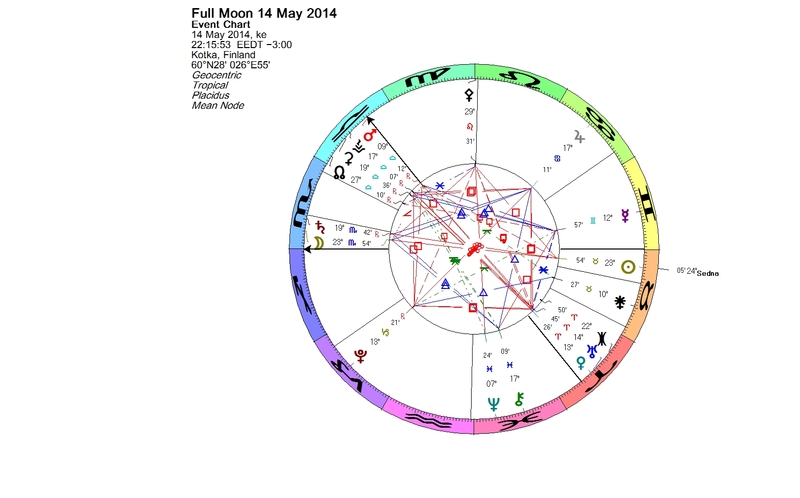 This entry was posted on Thursday, May 15th, 2014 at 9:45 pm	and is filed under Full Moon. You can follow any responses to this entry through the RSS 2.0 feed. You can leave a response, or trackback from your own site.